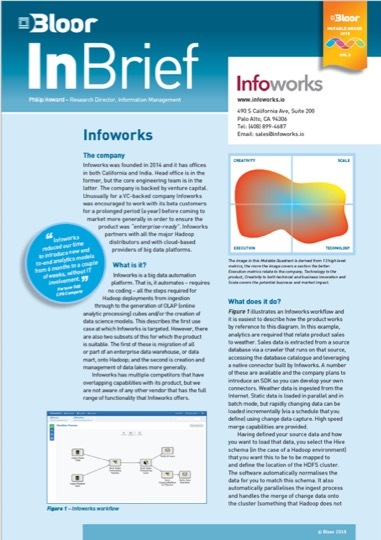 Read what one of the leading analysts in the data management world thinks of Infoworks. In a detailed, yet concise, review of Infoworks, Philip Howard gives his assessment of the Infoworks solution ranging from: what it is, to what it does, to why you should care. Read the Bloor 2-page summary to find out why Bloor Research believes that "While we know of many competitors to Infoworks we don’t of any other vendor that has the breadth of capability – or the automation – that Infoworks can provide."